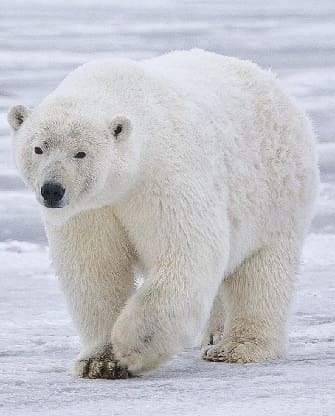 On this page are lists of interesting facts about the Polar Bear, one of the strongest animals on earth. On this page you will read facts about their diet, adaptations for the cold climate they live in, fur, where they live, and how many cubs they have, as well as other interesting facts and information suited for kids and adults alike. Scientists who study the habitat of these animals point out that the reason why polar bears continue to lose their habitat is because of global warming. Read on to find out what is being done to save this endangered species. Click here for a great selection of Amazon.com books about Polar Bears. Although the polar bears are massive animals, it is really their bite force that makes them so strong at 1200 pounds per square inch. This amazing animal's enormous size adds to its incredible strength, in fact, it can kill basically any animal with just one swipe of its paw. Polar bears have adapted to living in one of the coldest region on earth, the Arctic. These bears can be found in Canada, Russia, Norway, Greenland, and in one U.S. state, Alaska. The polar bear has no natural enemies and no fear of humans. Polar bears generally have two cubs at a time which will remain with the mom for over two years while they learn the life skills necessary to go out on their own. The males do not help their offspring and can sometimes even be a threat to them. Because of climate changes, the population of polar bears has declined significantly over the last several years. To help keep the population from declining further they have been placed on the list of endangered species and have special protections in place to prevent humans from killing them. These bears never drink water, even with all the ice and melting snow around them. The seals and other animals they eat provide them with enough liquids to survive. Polar bears are primarily solitary animals that mainly come together during mating season and when there is enough food to feed a group. The average life span of this animal in the wild is approximately 25-30 years. They can live longer in captivity. Although the Polar Bears fur appears white or cream colored, it is actually hollow and transparent. The light reflecting off the fur makes it seem white.Since it is hollow, polar bears run the common risk of growing algae in these hollow hairs and thus making it appear green. Underneath these hollow hairs, their skin is actually black. Polar bears are the largest of all the bear species, easily weighing up to 1,200 pounds (544 kg) and reaching a length of 10 feet (2 meters). They are known for their huge feet, which serve several purposes. It helps them to walk over the sometimes deep snow by acting as a snowshoe would and spreading the animal's weight around. Their large feet also help them to swim by acting as paddles in the water. This bears sense of smell is its strongest sense. They rely on their sense of smell to detect their prey from distances of up to 1 mile (1.6 km). Incredibly strong swimmers, polar bears are capable of swimming up to 100 miles (160 km) at a time and can keep up a pace of 6 miles per hour (9.6 kph) for quite some time. Their blubber actually aids them in staying above water while swimming. When a rest is needed they rely on sheets of ice as floatation devices.